Your project is complete but now your concern is how to put a cove on the corners without causing tearout. 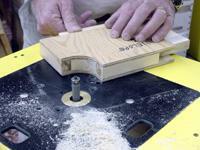 This jig slips over the corner of your project and allows you to cut with the grain on one half of the corner. 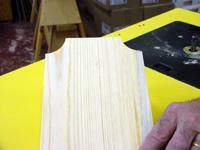 Then you simply flip the material over and cut with the grain on the opposite side. You never cut against the grain of the wood. 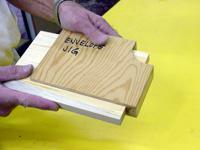 This envelope jig is made from two pieces of 1/4" plywood and pine spacers the same thickness of your project material. Tack the two pieces of plywood together and draw the desired radius. 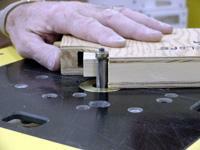 Remember the material rests against the pine spacers and this is where the radius will start on your material. After the cove is cut and sanded smooth, nail the plywood to the spacers to create an envelope for your material to fit into. 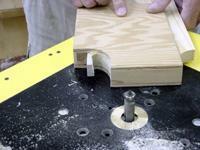 In a table mounted router use a flush trim bit to cut the cove. Make the cut into the wood but don't go so far that you cut against the grain. Simply turn the material over and cut the other half of the cove.